"Cathleen C. Moore, Westbrook College, Class of 1976"
Westbrook College student Cathleen C. Moore, Class of 1976, was a Library Technology major and a Day Hop. For her senior class candid photo, which appeared in the 1976 Tower Yearbook, she wore a dark skirt and a long-sleeve, crew-neck sweater. Her hair was dark, shoulder-length and parted on the side. Dark curls brushed her shoulders. 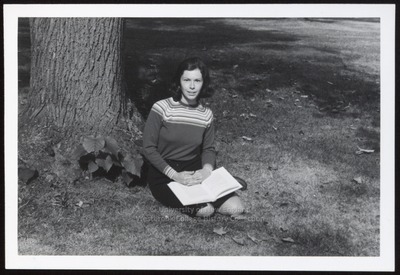 Cathy sits on the grass at the base of a tree with a large book open on her lap.